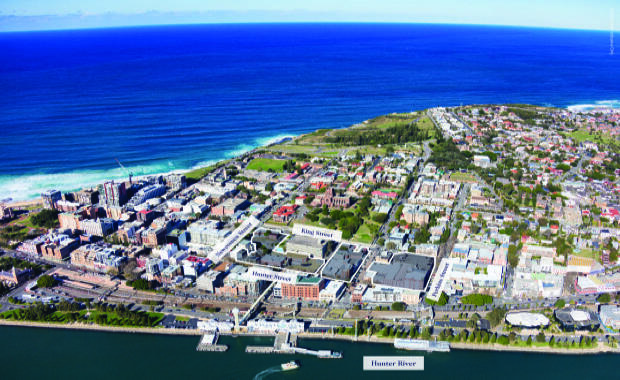 Sydney hotel owner and developer Iris Group has paid $39 million for a huge Newcastle site - one of the most significant property transactions in Newcastle in several years. The purchased site also comes with approval for a 55,000 square metre residential, retail and commercial development. Vendor, GPT and Urban Growth NSW’s so-called East End (Newcastle CBD) Portfolio covers four city blocks and 1.66 hectares of premium land, the majority bordered by Hunter, Newcomen, King and Perkins streets. The property was recently DA approved by the Joint Regional Planning Panel (JRPP) for 47,800 square metres of residential, 4900 square metres of retail, and 2700 square metres of commercial space. "Rarely is an opportunity of this magnitude offered to the market," Savills Director Residential Site Sales Stuart Cox said. "It is a master plan approved site with mixed use development potential in such an historic location and one with enormous forecast growth as Australia’s pre-eminent regional city. "It is without doubt one of the best opportunities to be offered to the market in New South Wales, and arguably Australia, this year,’’ Mr Cox said. He said the sale was a significant development for Newcastle, one which would create a vertical village of the like the City had never seen before. Neil Cooke, who assisted Mr Cox with the marketing campaign, said the Expressions of Interest campaign, as expected, had attracted a massive number of enquiries from local, interstate and overseas buyers keen to deliver affordable housing to a rapidly growing market. "There were a huge number of enquiries from some of Australia’s best known developers and that was a reflection of both the property’s location and its enormous potential. "Newcastle has undergone an extraordinary economic turnaround recently including a significant rise in the construction of inner city apartment dwellings with little supply available for owner-occupiers and investors,’’ Mr Cooke said. He said demand was being driven, at least partially, by the increasingly unaffordable prices in Sydney forcing investors to look to regional centres. The portfolio’s existing improvements include a mix of 25 commercial and retail use buildings with a gross floor area of approximately 23,500 square metres. They contain 81 tenancies, of which 25 are currently vacant, returning net annual income of $1.15 million.